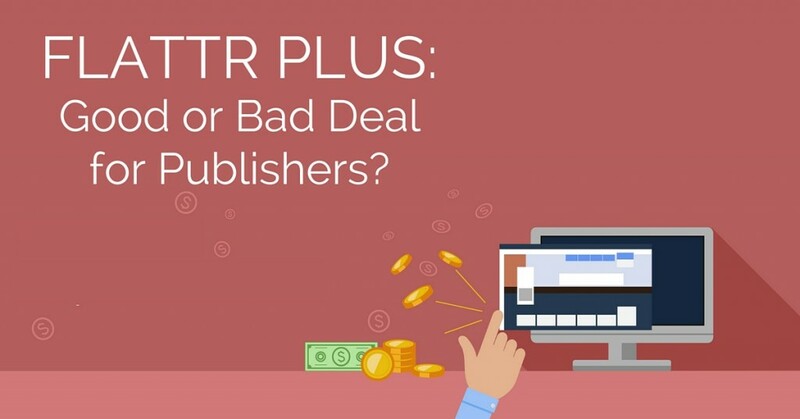 Flattr Plus: Good or Bad Deal for Publishers? As publishers all across the globe are looking for ways to deal with the growing usage of ad blocking software, Adblock Plus is teaming up with Flattr on an initiative that will supposedly help publishers recoup some of the revenue lost when ads aren’t shown to site visitors. But is this effort a true attempt to mitigate losses for publishers who depend on ad earnings to fund their sites, or is it really intended as a means for Adblock Plus to further monetize its own product? According to a press release distributed on May 3, a beta version of this new service – called Flattr Plus – will launch early this summer. Interested parties can start signing up now at https://flattrplus.com/ to get early access, and publishers can fill out a contact form if they want to get more information about how the service works. What Is Flattr Plus and What Does It Do? In a nutshell, Flattr Plus is similar to a donation or micropayment tool for letting users contribute money to be paid to content creators and digital publishers. Instead of the user stipulating who the money goes to, Flattr Plus utilizes an add-on to track which content sites you visit and then will use an algorithm to determine how to distribute your allocated budget to these sites. When interviewed by TechCrunch, Ben Williams of Adblock Plus confirmed that if you’re a publisher and want to benefit from this service, you’ll have to sign up with Flattr Plus. Otherwise, you’ll just be informed of what you could have earned if you were part of the program. On top of that, Flattr Plus will take a 10% cut of all payments made through the service. Will Micropayments and Donations Put a Dent in Lost Ad Revenue? The PageFair and Adobe 2015 Ad Blocking Report estimates that $21.8 billion dollars in global revenue was lost in 2015 due to ad blocking. That’s a pretty substantial sum of money. Could services like Flattr Plus ever match that amount? The answer to that question depends on two main factors – the percentage of Adblock Plus users who will sign up for Flatter Plus and how much an average subscriber is willing to part with each month. Past experiments suggest that while Flattr Plus might be a decent idea in theory, practical results could be a whole other story. For instance, NiemanLab reports that when Blendle launched its content micropayment model in the Netherlands and Germany, 650,000 people signed up for the service but only 20% of users connected a credit card to their account. In the Blendle model, readers pay a few cents and are then able to immediately read the article they paid to see, so both publishers and users can actually physically assign value to a piece of content. With Flattr Plus, that won’t be the case. A user may designate a budget of $5 a month for the content they view but read dozens, or even hundreds, of articles. We’ll have to see Flattr Plus in action before making any in-depth analysis, but it seems unlikely the option will come close to matching earnings lost to ad blocking software. When talking about online ads, the topic of privacy almost always comes up. For example, in a survey from the Adobe and PageFair report cited above, 50% of respondents said they would start using an ad blocker if they felt their personal data was being misused to personalize ads. If that is the case, people may be reluctant to use Flattr Plus for the same reason. That is, if a user is concerned about privacy, does he really want to install a tool that tracks every piece of content he views and how he engages with it in order to distribute payment to the publishers of the content? “Of course, you are always in charge of the process and your privacy is important to us. Although the language is meant to sound reassuring, it doesn’t really explain how much of your data will be used or how its payment distribution algorithm will work. Also, the suggestion that users can edit data is a little worrisome. Does this mean that people can choose to delete sites from their history if they don’t want others to know they’ve read them? If so, Flattr Plus’s algorithm may not be quite as fair as it seems at first glance. When talking in generalities, people have the tendency to associate advertising as something bad that they want to avoid. So, if it’s easy to install an ad blocker, many will without thinking about it. However, a recent test by a group of publishers in France has shown that when readers are educated about the impact of ad blockers on a site’s earnings, they do listen. As reported in Digiday, for a week in March, several French publishers asked readers to either turn off ad blockers or whitelist their sites after explaining how ad earnings help them pay the bills. While some of the publishers blocked content for those who didn’t comply with the request, others let readers continue on to the content after reading the message. Results of the test varied by publisher, but most were pleased with the results. As an example, Le Monde was one of the publishers who showed the informative message, which led to 13% of its users whitelisting the site. L’Equipe took a stronger approach and blocked content to readers using ad blocking software. As a result, about 40% of its users whitelisted the site. Flattr Plus may be able to contribute to the overall solution to the issue publishers face concerning ad blockers, but education about online ads and related topics are likely to impact the situation even more. The average adult spends 5.6 hours a day on the Internet, but still may not appreciate how much of that time is being paid for by online ads. In addition, they may not realize that ad blocking tools are not completely altruistic or that they have their own monetization strategies that include whitelisting advertisers who show “acceptable ads” in exchange for payment from those companies. Also, not only do ad blockers threaten the availability of free content for users, their definitions of acceptable ads and site layouts have the potential to limit the freedom of publishers to choose the design and direction they want to use for their sites. If users feel that a certain site is annoying because of its ads, they have another option available to them – they can simply leave that website and visit another. Free content is not a right. It’s a privilege. And, more often than not, it’s one that is paid for by online ads.